Recently a 7-year-old child was brought to my office for a consultation regarding a rash on her arm. The family had been vacationing in the Caribbean at a resort three weeks earlier. During their holiday, the little girl begged her mother to allow her to have a henna tattoo, which the mother consented to. A beach vendor of such tattoos drew a picture of a fish on her upper arm using “black” henna. Upon their return, the image of the fish gradually faded, but revealed a red, crusty lesion, along with mini-vesicles, where the dye had been applied. Three weeks later, after the application of a corticosteroid cream for the previous 10 days, her rash had still not completely disappeared. With no previous experience of such rashes, I turned to the medical literature and discovered that this is a well-described reaction and that children are particularly sensitive to it. 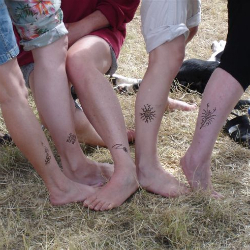 The temporary tattoos of henna originated in India and the Middle East and were often used in religious ceremonies, such as weddings. Henna itself is harmless, made from the ground leaves of the plant Lawsonia inermis whose active ingredient is a naphthoquinone mixed with water or oil. When applied to the skin it does not penetrate into the dermis but stains the epidermis a reddish-brown. It doesn’t cause any allergic reactions. The problem comes when the henna is adulterated with additives and in the case of ‘black” henna, this additive is para-phenylenediamine (PPD), which is known to cause a delayed Type 4 sensitivity reaction. These delayed reactions may occur from 1-3 weeks after the tattoo, as in the case of my patient. PPD penetrates deeper than henna and passes into the dermis where it has access to the blood. Occasionally, it may cause a more severe systemic reaction and in children with glucose-6-phosphate dehydrogenase (G6PD) may result in acute hemolysis (the destruction of red blood cells which leads to the release of hemoglobin from within the red blood cells into the blood plasma). PPD cross reacts with other drugs including sulfonamides, para-amino benzoic acid (PABA-used in sunscreens), benzocaine and para-aminosalicylic acid (PAS), used in the treatment of tuberculosis. If someone was allergic to one of these, they’d be at risk to react to PPD in henna tattoos. Other additives used in henna to achieve different colours such as lime, lemon, fig, celery, carrot or parsley contain compounds known as psoralens, which are converted to quinones by sunlight and can cause a photosensitivity rash. Caveat emptor really does apply to henna tattoos, especially in kids. Parents should be extra cautious when the family is lying on a beach and is approached by a vendor wishing to sell a henna tattoo! Urkin, Jacob. Henna tattooing dermatitis: consider an additive as the culprit. British Journal of General Practice, Ocotber 2006, p794. Richard Haber, MD, FAAP, FRCPC is an associate professor of pediatrics at McGill University and the Director of the Pediatric Consultation Centre at The Montreal Children’s Hospital.